NOTHING quite beats the feeling of standing poised at the summit of a gleaming ski run, boots clipped in and goggles down, surrounded by peaks and blue sky, ready to launch yourself down the piste. Well there’s something that certainly puts a new spin on that feeling – the knowledge that it’s the height of summer, and that only an hour ago you were sunning yourself in typical July temperatures at an outside bar before catching the gondola up. I’m at Les Deux Alpes, France’s second oldest ski resort after Chamonix, not far from Grenoble in the southern Rhones-Alpes region. It is home to Europe’s largest skiable glacier soaring to 3,200 metres, and hosted the 1968 Winter Olympics. Here in summer 2013 though the winter season crowds are long gone and the hotels and resort thoroughfares fairly quiet. And that’s what makes it ideal for a summer holiday with a difference if you’ve caught the skiing bug early. At this altitude there are never any of the dreaded end-of-season slushy pistes, and fewer skiers mean shorter lift queues. The corollary is that the apres-ski is quieter too, though bars and restaurants are still very much open. If ever you tire of the several runs and freestyle area on offer, there are many other ways of descending the mountains in summer. Paragliding’s one option, but a more heart-pumping method is mountain-biking – proper mountain-biking – with tracks carved into the slopes for that purpose. Clad in helmet and body padding I and my companions spent an afternoon hurtling down these tracks at sometimes alarming speeds, learning swiftly how and when to brake as bends loomed and gradients steepened. With dirt kicking up everywhere and some inevitable wipe-outs, we emerged at ground level mud-splattered from boots to helmet – I hadn’t had as much earthy fun since boyhood mischief years. If you fancy a break from the frenetic, the resort retains its Alpine charm for simply wandering around. Further into the valley lies the mountain village of Venosc where locally-made crafts can be picked up, while back at the hotel (I stayed at Hotel Le Souleil) the more relaxed ambience about the place made it feel almost Christmassy. Les Deux Alpes’ final trump card is that it’s closer to an airport than other resorts – served by Saint-Geoirs, Lyon and Geneva – and is only an hour’s drive from the city of Grenoble which, as it’s served by the same airport, is almost obligatory to visit and stay at in the same trip. Nestled between three mountain ranges, the “Capital of the Alps” is one of the region’s foremost cities. Despite its mountainous surroundings it’s also France’s flattest, having been built on the wide alluvial plain of the River Isère. This makes it ideal for exploring by bicycle, which are easily rentable (and cheaply at €5 a day) from the railway station or MetroVelo offices. The city is classically French, with lively green squares and ancient Gallo-Roman sites sitting amid architectural heritage dating back many centuries. And alongside the old buildings are some grand modern urban projects like the Bonne ecological neighbourhood, similar to London’s Greenwich Millennium Village, where my hotel resided (Caserne DeBonne). 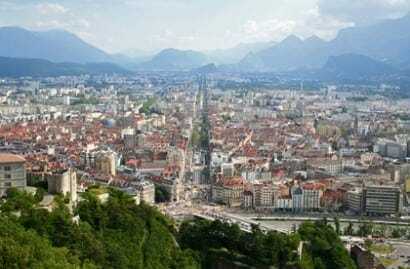 My cycle around the city centre brought me to two memorable visitor sites displaying Grenoble’s historical and newer aspects at their most fascinating. First, the Musée de Grenoble – a striking contemporary structure exhibiting masterpieces chronologically from the 13th century to the modern era of Monet and Matisse. Things then teleport back to the early Middle Ages in one of the city’s oldest neighbourhoods, at the deconsecrated St Laurent church which now stands as a complex archaeological site and museum, unique in Europe. Almost 2,000 sepulchres, some from the 4th century, have been discovered beneath this one-time major burial site. The ongoing archaeological dig is open to visitors, however the spectacle of partly-exposed ancient skeletons can be quite unsettling. There’s nothing like a bit of morbid fascination though to work up an appetite, and Grenoble duly delivers some delicious provincial specialties like Tartiflette and Gratin Dauphinois, with one family-run restaurant doing a sterling job on that front (L’aiguillage, on rue Abbé Grégoire). And expect to be offered at some point during your trip a post-prandial Chartreuse – the spicy herb-based liqueur made for centuries by Carthusian Monks in the Chartreuse mountains overlooking the city. My final view of Grenoble is an arresting panorama from the top of the Bastille – an ancient fortress towering above the city since 1591. To get up there you ride one of the ‘bubbles’ – one of the world’s first urban cable-cars, built in 1934. After disembarking you’ve got options comprising a day out in itself, including a fine restaurant overlooking the valley (Téléphérique) and the opportunity to zipwire hundreds of metres high between the fortress and a neighbouring mountain (at Acrobastille) – a final heart-pounding blowout to truly crown the trip. 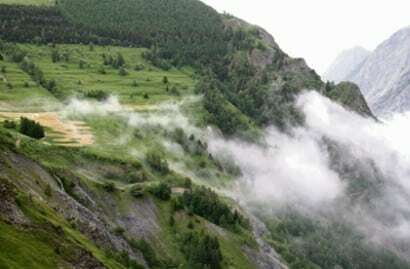 When you come down from the mountain, be it at Grenoble or Les Deux Alpes, the overriding urge is to go straight back up the next day to repeat whatever you were doing – that’s why a few days at each place is a great idea. So I know now for sure what I’m doing for my stag weekend if I ever get married: a dual-location experience of culture and action at their highest, and all less than two hours away from London.